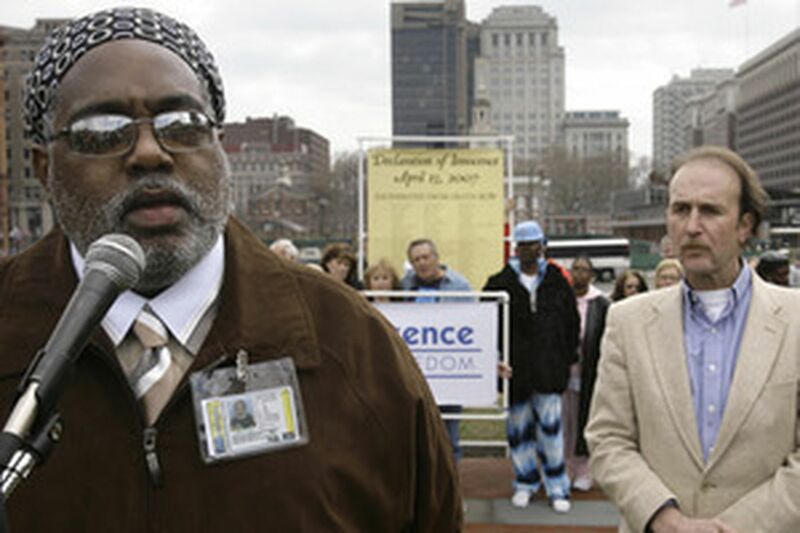 Harold Wilson (left), sentenced to die for a triple murder, and Ray Krone, who spent 10 years in an Arizona prison for a homicide - both exonerated by DNA evidence - attend yesterday's rally on Independence Mall calling for a moratorium on capital punishment in Pennsylvania. He was called "the Hatchet Man." Harold Wilson, of South Philadelphia, spent more than 16 years in jail after being sentenced to Death Row for a 1988 triple slaying in which the victims, including a 64-year-old woman, were killed by a carpenter's ax. In 2005, Wilson was set free - acquitted of the murder convictions based on DNA evidence from blood at the crime scene. With a wind blowing across Independence Mall yesterday afternoon, Wilson stood next to 17 other men from across the country who had been exonerated of crimes they were found to have not committed. All but one had been sent to death rows. One by one, each man urged Pennsylvania to enact a moratorium on the death penalty. "If it had been up to the state of Pennsylvania, I would be dead today," Wilson, now 49, said at a news conference outside the Independence Visitor Center, across the street from the Liberty Bell. After each former inmate spoke, a man rang a makeshift metal bell, which clanged as the former prisoner then signed a large "Declaration of Innocence" banner listing the 123 people who have been exonerated since 1973 from death rows nationwide. The freed men gathered to launch the Pennsylvania Moratorium Coalition - a group that includes the Philadelphia-based Witness to Innocence project and various faith-based and criminal-justice organizations. "There's more than 220 people sitting on Pennsylvania's Death Row today," said Kurt Rosenberg, director of Witness to Innocence, which organized the event. "If Gov. Rendell or any of the 200-some odd legislators who represent the commonwealth were to claim that none of them are innocent, I think they would be lying to you." According to the Death Penalty Information Center, since 1976, when the U.S. Supreme Court reinstated the death penalty nationally, Pennsylvania has executed three people and exonerated six. Executing the innocent is a risk, Barry Scheck, co-founder of the Innocence Project at the Benjamin N. Cardozo School of Law in New York, said at the event. "Cases go through the Pennsylvania system again and again, frankly because not-adequate funding is being given to the lawyers at the trial end," among other reasons, Scheck said. Former Texas prosecutor Sam Millsap Jr. also spoke out against the death penalty. He has questioned whether he helped put a possibly innocent man, Ruben Cantu, to death when he was Bexar County district attorney. "There are also prosecutors and former prosecutors in America who recognize that the system simply doesn't work," he said. The system didn't work for Ray Krone, of Dover, Pa., who was convicted in 1992 in Arizona for the murder of a barmaid. After 10 years in prison, Krone was set free after DNA evidence from the victim's clothing matched that of an Arizona sexual predator.